On June 12, 2016, at 1931 eastern daylight time, a Piper PA 28RT-201, N42JA, was destroyed when it impacted terrain shortly after takeoff from Little Mount International Airport (7KY3), Taylorsville, Kentucky. The pilot received serious injuries. Visual meteorological conditions prevailed, and no flight plan was filed for the personal flight destined for Samuels Field Airport (BRY), Bardstown, Kentucky. The flight was conducted under the provisions of 14 Code of Federal Regulations Part 91. Due to his injuries, the pilot did not recall the accident. A witness located near a hangar about one-quarter of the way down the approximate 1,750-foot-long turf runway, observed the airplane during the takeoff roll. The engine was "sputtering" and the airplane "seemed slow" as it passed by, at an estimated speed of about 30 knots. The witness attempted to contact the pilot using a handheld radio and asked him if he was going to reject the takeoff, but the pilot did not respond. The airplane rotated and climbed briefly, then descended and impacted downward sloping terrain about 500 feet below, and 250 yards beyond the departure end of the runway. Examination of the accident scene by a Federal Aviation Administration (FAA) inspector revealed that the grass on the turf runway was between 4 to 6 inches long throughout its length. The airplane came to rest inverted in a wooded area and was mostly consumed by a postcrash fire. The left wing had separated during the impact sequence and was located about 25 feet up the debris path closer to the runway. The left wing contained fuel and was not fire-damaged. Flight control continuity was confirmed from the cockpit to the rudder, elevator, and right aileron, and from the cockpit to the left wing area. One propeller blade was bent slightly aft near the root, the other was straight. No gouges were observed in the leading edge of either blade. The engine sustained fire damage and the crankshaft could not be rotated by hand. Capital City Airport (FFT), Frankfort, Kentucky was located about 17 miles northeast of the accident site, at an elevation of 804 feet. At 1953, the reported weather included winds from 330 degrees at 4 knots, temperature 28 degrees Celsius, dew point 21 degrees Celsius. 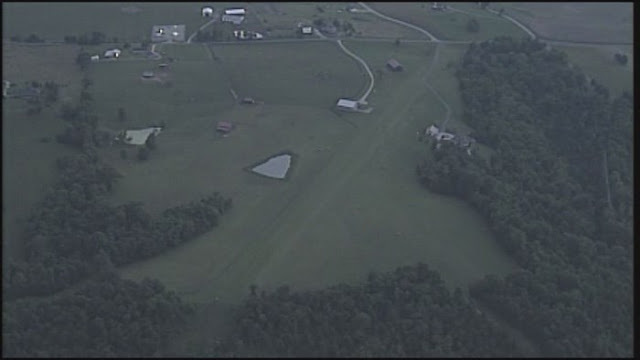 On June 12, 2016, at 1931 eastern daylight time, a Piper PA 28RT-201, N42JA, was substantially damaged when it impacted terrain shortly after takeoff from Little Mount International Airport (7KY3), Taylorsville, Kentucky. The pilot received serious injuries. Visual meteorological conditions prevailed, and no flight plan was filed for the personal flight destined for Samuels Field Airport (BRY), Bardstown, Kentucky. The flight was conducted under the provisions of 14 Code of Federal Regulations Part 91. A witness located near a hangar about 1/4 of the way down the 2,000-foot-long turf runway, observed the airplane during the takeoff roll. The engine was "sputtering" and the airplane "seemed slow" as it passed by, at an estimated speed of about 30 knots. The witness attempted to contact the pilot using a handheld radio, and asked him if he was going to abort the takeoff, but the pilot did not respond. The airplane rotated and climbed briefly, then descended and impacted downward sloping terrain about 500 feet below, and 250 yards beyond the departure end of the runway. Examination of the accident scene by a Federal Aviation Administration (FAA) inspector revealed that the grass on the turf runway was between 5 to 8 inches long throughout its length. The airplane came to rest inverted in a wooded area and was mostly consumed by a post-crash fire. The left wing had separated during the impact sequence and was located about 25 feet up the debris path closer to the runway. The left wing contained fuel and was not fire-damaged. Flight control continuity was confirmed from the cockpit to the rudder, elevator, and right aileron, and from the cockpit to the left wing area. One propeller blade was bent slightly aft near the root, the other was straight. No gouges were observed in the leading edge of either blade. The engine crankshaft would not rotate by hand. The engine was retained for examination at a later date.